Search GT is an ultra-fast search add-on for Windows that allows you to find just about any file in the blink of an eye. It can literally traverse hundreds of thousands - even millions - of files in seconds. And, because Search GT seamlessly integrates with Windows Explorer, there's no learning curve. You already know how to use it! So what makes it so fast? In a nutshell, Search GT reads the file system directly, bypassing all of the Windows system libraries that are normally used for file enumeration. This allows users to get the results fast, and ensures that those results are always up-to-date. Search GT's blazing search speeds are up to 100 times faster than ordinary search engines. Most searches are completed in well under 3 seconds. No performance footprint on the system. Search GT only uses system resources if the user is actively searching. No indexing. Search GT does not work in the background and writes nothing to the hard drive (excepting user search settings). 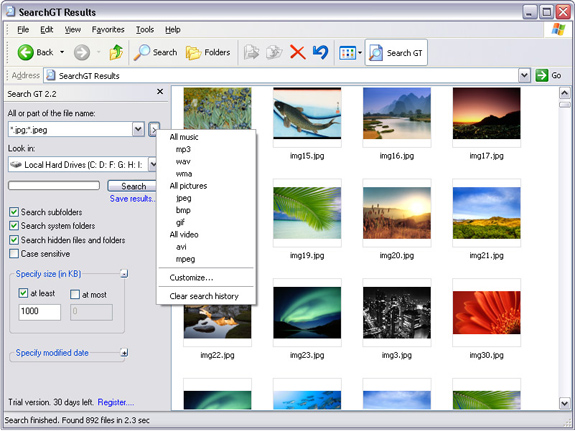 Complete Windows Explorer integration. 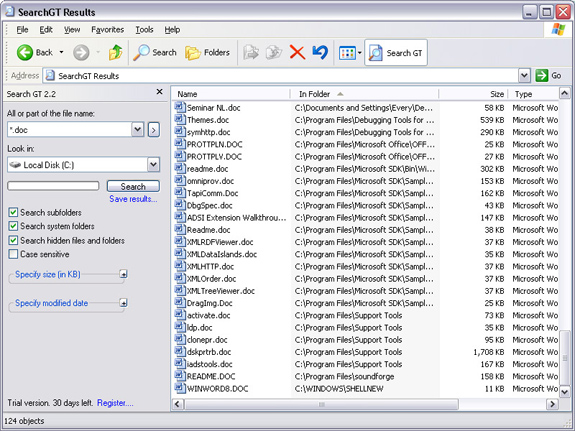 Search GT accurately duplicates the Windows File Search functionality (check the screenshots). Up-to-date search results. All file system changes (added/removed files, changed file names, etc.) are immediately reflected in the search results window. Pete Hines This software is still version 2.3 which has not been updated since April 2008, still no Vista integration, what gives? I would like to purchase this product, but if it is out of date and appears not to be actively developed (abandonware?) i will leave it alone. I was using this this great piece of code until FEB 2008 when I switched to Vista 64.
adrian williams I've also asked recently, and the Vista development is now on hold. It's a shame because this program is exceptionally good on XP. Pete, The xp version is still supported and works without a glitch. If you are sticking with XP I'd recommend this software without hesitation. It's rock solid in its present form and isn't matched for speed. It'll pay you back in the 1st week of use. Maybe if a few more XP users buy it, the Vista development may start - pretty much a catch 22. Jon Grewer I too bought and installed version 2.3. It doesn't work with Subst drives. Otherwise it works the way I wish the built-in file search would work. I asked the developer to update the program to work with SUBST drives and was told that it would be a few weeks. That was back on 9/22/2008. This is now 3/15/2009. No communication since then despite requests for status updates. Bottom line, it was worth it to me for Win XP. It is fast and except for the caveats meantioned trouble free. I would recommend this program but only with some reservations. Joe Platt Vista out long enough by now (sp2 now available) Windows 7 in public beta, developers are not doing themselves any favours by not making their software compatible with current OS releases. This developer does not seem to be adding new features or compatibility to an otherwise good piece of software, at least for XP users. I have used this on XP (ver 2.3) and it works well, but i cannot recommend it, due to the fact that development on it seems to have stalled. Ray Greene I just tried the demo, doing a search for *.txt brings up an error message saying "Too many matching files found. Only the first 5000 are displayed." Is this a limitation of the demo or is it always there? I have a big hard drive and I would hit this limit quite often. Thank you for your comments - I always appreciated them since we started communicating. I would like to apologize for not keeping promises regarding program updates. The reason is that the development was stopped some time ago (because of not enough funding) and currently only support is active. However the project is not abandoned, in fact there are a number of new features that were left in beta testing stage, and as soon as we get some funds for development we'll be able to issue a new release. The limit of 5000 files is due to a fact that Windows Explorer starts to slow down if too much files are present in the window, it's not a demo limitation. Carlos Matias thank you for those precisions Arshak. I just wanna encourage XP users to close their eyes, and and buy your tool! it's a great piece! Also, try sending an email to customers to know is they're ok with a brand new vista version at low cost (say $15 or 20 $). I'll be the first to sign! last word : Good luck Arshak. Arshak Isajanyan Thank you very much Carlos! As for the Vista version - the upgrade will be free to all registered users - it is our policy. Change your policy and get the funding to produce a Vista version. If a fair upgrade price is charged I'm sure that all the SearchGT users on XP that have migrated to Vista will pay for the upgrade. If you offer a trial version, new customers would buy also. By being too fair, you've lost out on the ability to further your development and the end users dont see the benefit. I'll pay $20 towards your development of the vista version - email all your customers and get their views. I say " i'll be the first!". so this is auction day! I wanna be the first for $25. Arshak Isajanyan Adrian, Carlos, I really appreciate your input. We are expecting to get some funding in approximately a month. If it fails - then I agree and I think we should try your suggestion. I'm honored to have you as our customers, thanks again! Don Bone I am truly astounded that you are promoting software that is not Vista compatible!!! I have successfully purchased lots of software using the Iconico Daily Deals and never experienced problems previously. Such is my confidence that I often do not "try" before I "buy", which was my mistake in this case! I now have purchased a useless piece of software! Is Isatech working on a Vista compatible release? If not, why not? Perhaps in future you could make it much clearer in the software description and/or elsewhere on the "deal" page regarding any specific incompatibilities. After all, we are now talking about Wndows 7, so Vista can hardly be considered as a new OS?? Roger Thomasson Don, sorry for the trouble. We do in fact display which versions of Windows a particular software title is compatible with -- it's up there in the price box (top right). Listing the incompatibilities would be difficult as well as extremely unusual. Your order has been refunded. Sorry for misunderstanding. Ray Greene Well I'm very impressed with the speed so I've purchased it, but I would like to request the option to remove the limit of 5000 files in the results. I'd much rather have Explorer slow down than have an incomplete search. Thank you for purchasing Search GT. Next version will have that limit adjustable. joe blow Development of this software for Win7 appears to be dead, and therefore this thread should be closed and archived. Perry Eastwood Now this is October 2013. Hard to believe that things did not move. But waiting. Kelly Hamblin Now on my PC it has quit working. I still have the setup files but when I try to run them, a popup appears and asks if I really want to uninstall SearchGT. Attempts to download it online fail.